ü Anti-depressants – Talk with your physician about taking something to get you over the hump. There is no shame in it, so don’t suffer needlessly. You’re going to hurt no matter what you do, but these at least enable you to function. ü Cry – You don’t always have to be stoic or strong. When you are sad and distraught let yourself cry, wail, and scream. This isn’t authorization to do it all day – but it is permissible and beneficial to cry when you need to. ü Remember them – Instead of spending all your time trying not to think about your deceased loved ones, set aside time each day specifically to remember them. Find a place where you can sit uninterrupted and think about them exclusively for an allotted amount of time. Fighting the inevitable serves no purpose, so work with your feelings. Make this a positive and healing thing to look forward to each day. ü If you’re tired, sleep – The stress and shock our bodies go through is incredible. Learn to listen to what you body is saying to you. Take a nap in the middle of the day if you need to. Grief is a little easier if you can get some sleep – wherever/whenever you can. ü Do what you can, when you can – Your energy will come in waves, so utilize it when you have it. Bursts of energy are opportunities to do all those things you can’t seem to tackle when you’re on the low end of the roller coaster. Prioritize you needs and be ready when it hits. ü Proper diet and exercise – The correct foods will build up your immune system and improve your mental and physical state. Exercise will help with your depression, fatigue, and sleep issues. ü Minimize the use of alcoholic beverages – Drowning your sorrows in alcohol is an easy thing to do, but don’t do it. It will make your depression worse and it will stall any progress you might be making toward recovery. ü Get out of the house – When you feel yourself getting sucked into the black hole, get in the car and go somewhere. Better yet, pick up a friend and do something together. If you can’t leave the house, at least try to make it outside, and get a change of scenery for yourself. 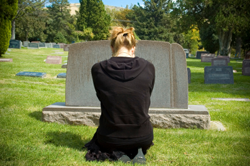 ü Grief Counseling – Talk therapy is probably the most important tool out there. A grief counselor is a neutral party that you can say anything to without being judged. If you don’t have insurance, check for community grief groups or contact the local chapters of national organizations like these: The Compassionate Friends, Survivors of Suicide (SOS). Join a group where you can share with those who are in the same situation you are. They’ll get it, and nothing feels better than being able to share with people who do. ü Talk to your friends – If you aren’t ready for a support group – talk to your friends. There are certain things we are only able to share with people who know and love us. Getting things out into the open air will improve your state of mind and general well being. ü Write a letter to your loved one or keep a personal journal – Writing my thoughts and feelings down in letters to my son was very helpful to me. Having this personal record will allow you to go back and read them later; in review, you will see how far you have come in your recovery. ü Allow yourself the right to laugh and enjoy yourself – Venture out to social gatherings with your friends. You don’t have to stay long if you don’t feel up to it, but at least try. You’ll benefit from being with people that care for you. ü Get a dog or pet of your choice – There is nothing like unconditional love and pets have that to offer all day, every day. Our dog Maxx is one of the best tools in our toolbox, and by far the most valuable one we own. ü Make a scrapbook of your loved one – It is very therapeutic to go through your photo albums; select your favorites and put them into one book. ü Memory box – I keep a box of my son’s personal items in his room. I created this tool to keep my need for physical touch at bay. Inside the box, I put a few of the items I treasured most. It is a contained source of comfort, and when I feel the need to touch him, touching his things is what gets me over the hump. ü Re-decorate – Paint a room. Rearranged your furniture, pictures, and accessories in the main living area. This will do wonders for you mentally, and was worth the time and effort it takes to physically create change. ü Reach out to other grieving families – One day you will be able to help someone else walk this path of grief, like others are doing for you now. It is rewarding and healing to share your story and experiences as you continue t work through your loss. ü Read – I read all kinds of books: spiritual, metaphysical, scientific, biographical, and self-help. Books helped to fill my mind with the promise of something better, instead of constantly dwelling on my sadness and guilt. ü Meditation – Grief is something we carry with us day in and day out. Meditation can give your mind and body a break from that pain. When you practice awareness (being in the moment), you learn to experience only what is right here – right now. Part of recovery resides in the ability to control our thoughts, so we do not have to drag our pain into every minute of every day. Meditation is the tool that can help us to do that. Tools have to be used to be helpful. It is hard to stay focused and always remember those things that can provide assistance. My advice is to keep your toolbox close, and utilize what it has to offer. Very useful guide. I have found that meditation has been powerfully transformative in my healing process, and brings me peace even when I think peace is impossible. What a great tool this list could be for a newly bereaved parent as they begin their grieving/healing process. Sally, thanks for your kind reply. I hope that I can be an example to others of how transformative meditation can be in the grief process. I’m actually developing a workshop right now for bereaved individuals, teaching many tools of self-expression and healing, including meditation and journaling. My time in meditation has brought a lot of “ah ha” moments as I’ve uncovered the layers of my grief. It doesn’t make the pain go away, but it has helped me find peace in the pain. I’m sorry that you have experienced enough loss in your life to have a “Grief Toolbox” but I am thankful you are putting purpose to your pain in sharing these tools with others. I’ll look forward to hearing more about your workshop. I believe the best part of healing is sharing what you’ve learned with others. Rewarding for both the giver and receiver!